Elephant poaching levels in Africa continued to outpace natural birth rates for the species in 2014, according to a new report released Monday by the Convention on International Trade in Endangered Species, or CITES. CITES’ Monitoring the Illegal Killing of Elephants program estimates that the poaching rate in 2014 remained virtually unchanged compared with 2013 numbers. While the current level is slightly less than the peak in 2011, elephant populations remain in decline. The estimates are based on the number of carcasses surveyed last year throughout Africa. Over 60 percent of those examined were deaths at the hands of poachers, with poaching levels above 50 percent considered likely unsustainable. 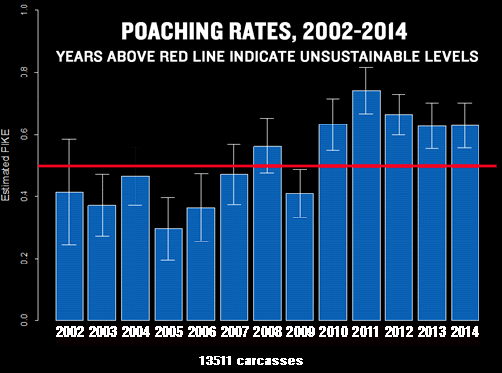 While poaching has decreased in East Africa, Central and West Africa showed slight increases. Countries with poaching sites of particular concern include the Democratic Republic of the Congo — where poachers have killed 30 elephants in the past two weeks alone at Garamba National Park — and the Central African Republic, where two years of civil war have severely destabilized what was already one of the world’s poorest nations, further weakening anti-poaching efforts in Bangassou Forest Reserve. Niassa Reserve in Mozambique and Benin’s Pendjari National Park were also listed as sites of particular concern for elephant poaching. Last week, the CITES Standing Committee further recommended that member states impose sanctions on the DRC, Nigeria and Laos for failing to submit their National Ivory Action plans. However, Scanlon noted the news from East Africa was promising. Though poaching rates are the highest in East Africa, the total number of elephants killed in the region has declined overall, “ which shows us all what is possible through a sustained and collective effort,” he said. Meanwhile, attitudes about ivory in the world’s largest market, China, may be shifting. According to a recent survey conducted by WildAid in China’s three largest cities (Beijing, Shanghai and Guangzhou), we found a significant improvement in awareness of how ivory is brutally obtained and how the ivory market is devastating elephant populations while supporting criminal networks. Click here to read more about this research. The CITES report was released at the African Elephant Summit in Kasane, Botswana.